October 18, 2010 - AgustaWestland, announced that the second AW159 multi-role military helicopter successfully completed its maiden flight at AgustaWestland’s Yeovil facility yesterday. During its maiden flight a range of general handling checks were completed and it performed as expected. The aircraft, designated TI2, is the second of three test aircraft that will complete a 600 hour integrated flight test program. The third aircraft, TI3, is scheduled to join the flight test program in late October 2010. Aircraft TI1 continues to perform air vehicle and flight envelope testing while TI2 will undertake the flight testing of the aircraft’s core and mission avionics systems, the systems and software having already been developed and tested on AgustaWestland’s Full Systems Integration Rig (FSIR). TI3’s main task includes undertaking load survey trials and naval development, including ship helicopter operating limit trials. AgustaWestland has now also established a new AW159 production facility at its Yeovil plant that introduces a pulse line production system to bring significant efficiencies to the final assembly process. 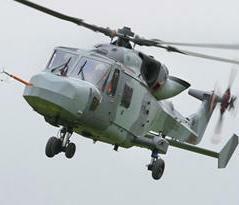 The first production airframe was delivered to AgustaWestland by GKN Aerospace on schedule in July 2010. The first flight of the second AW159, known as Lynx Wildcat in UK military service, marks another major milestone in the development of this new six-ton multi-role military helicopter, 62 of which have been ordered by the UK Ministry of Defense. The first aircraft will be delivered at the end of 2011 with the aircraft becoming fully operational with the Army in 2014 and the Royal Navy in 2015. The AW159 is powered by two new generation CTS800 engines, each capable of continuously producing 1281 shp giving the aircraft exceptional hot and high performance. The aircraft has an all up mass of 5790 kg with a built in capability to increase that to 6250 kg. The cockpit includes a fully integrated display system utilizing four 10x8 inch primary displays. Sensors include a nose mounted IR/TV imager with built in laser designator and for the maritime variant the Selex Galileo 7400E 360 degree active array radar. The AW159 also has a comprehensive integrated defensive aids suite comprising a missile warning system, radar warning receivers and a countermeasures dispensing system. Additionally the AW159 will be capable of carrying a range of weapons including machine guns, torpedoes, depth charges and the Future Anti-Surface Guided Weapon (FASGW). The AW159 program for the UK MoD continues to be on time and on budget and was the first major project to be awarded under the Strategic Partnering Arrangement signed by the UK Ministry of Defense and AgustaWestland in June 2006. AgustaWestland has also signed partnering agreements with a number of key suppliers on the AW159 program including Selex Galileo, a Finmeccanica company; GKN Aerospace, LHTEC – a partnership between Rolls-Royce and Honeywell, General Dynamics UK, Thales UK and GE Aviation.